Continuing reading about the adventures of Don Drake the diabolist is proving to be an interesting enough experience in this new series of novels. He's sort of like Harry Dresden but he's a lot more messed up and also cursed to go to Hell one day because of obvious reasons. Dominion is the second book in the series and it more or less picks up shortly after the events of the first book. We still have all the fun of Don having a pet arch-demon trapped in a fetish in his home, the same demon that is largely responsible for his education in magic. He's also choking at the bit to get free of Don's control, but that's just the way demons are. The first book was a little rough but it certainly showed a lot of potential and that kept me involved enough to want to see what would happen next. This book is definitely better but McLean also has some room to grow for sure. And he has a story that he's chasing down - you can feel that as you go through each page. It seems only fair to follow him through this journey. 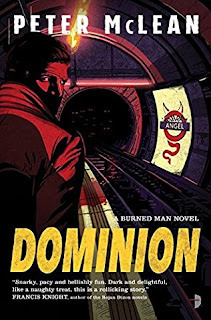 Synopsis: Dominion is the second book in Peter McLean's The Burned Man series of urban fantasy novels. Disclosure: I received a free advanced reading copy of this book in exchange for my honest opinion of the work. Don is a changed man. Or at least, he's trying to be a changed man ever since Trixie was named guardian of the Burned Man, and thus to some degree him. He's in love with the angel but it's not like she has a need nor an understanding of love but now they live together keeping watching over the arch-demon. He's now reliant on Trixie for income as he has stopped taking hit jobs from various unsavory characters. And this is an unneeded complication. Another deal with Wormwood leads to Don agreeing to do a favor for the gnomes, he earth elementals. It turns out that they are being terrorized by a fearsome creature they call the Rotman that destroys anything that it comes in contact with. The creature is clearly demonic and for the most part it seems Trixie should be able to handle it. But she's not quite as pure an angel as she once was although she hasn't quite fallen all the way either. And that's not even the whole story of what's afoot. What I Liked: I had complaints about how the first book didn't really explore magic all that much beyond Don summoning a demon or two and this follow-up book really tried to address this to some extent. We had a bit more discussion on how magic works and we also got some more exposition about supporting characters like Papa Armand and their brand of magic. Thus there was a lot of fair world building all around that the first book lacked. And while Don may not be a detective, we certainly had him handling a bit of a mystery given the Rotman under London and the limited aid and information that they were able to pull out of Trixie's Dominion when they reached out to him...or it? How our new little team dealt with all this along with the nasty help of the Burned Man made for a compelling core part of the story. And that just shows how his writing is getting better or he's at least past the initial setup and is now getting to the parts of the larger narrative that are a bit more exciting. What Could Have Been Better: There's still a lot of hasty characterization going on and some less than ideal setups for scenes and later reveals. One key piece was the appearance of a mangy orange cat that should have been a bit more prevalent or perhaps foreshadowed more but it wasn't. And given the eventual reveal of sorts, it felt a little short or a least like a wasted opportunity for a great moment for the reader. The narrative also feels a little uneven, which is a similar sore sport observed with the first book. Given the ending he wanted to achieve here, there were parts that didn't feel like they needed that much attention and so on. A great example is how the buildup to finding the Rotman didn't quite reach its peak before we got around to addressing that challenge. As much as there was a larger narrative in play with other pieces that needed to be moved around, it felt like that encounter came a little too soon to be fully "worth it" so to speak. TL;DR: Dominion is a stronger follow-up to the first book and demonstrates a lot of learning on the part of the author. It's definitely a great setup for the third book and it doesn't feel like a low point of a transition either. Thus the book gets 3.5 fell creatures of the underground out of a possible 5.